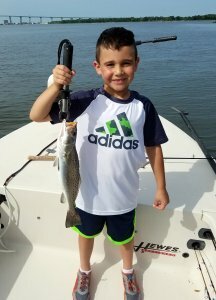 After catching one shark after another, Ryland decided he would like to spend the rest of the charter casting. We switched over to popping corks and mud minnows and let them fly. Constant cork dropping action for the rest of the charter. Ryland showed us how it was done by putting this 18″ beauty in the boat!